First of all Mr. Wills, kindly tell us who owns the company, who started it and why did you name your company Sobel? I am the sole owner of Sobel Network Shipping Co. Inc. and have been since 2015. I purchased Sobel Shipping Co. Inc. on January 1st, 2015 from Samuel Zekser. I had been in the business for almost twenty years prior to that and held numerous high level positions in several firms before meeting Sam. I was just an ordinary guy who was given an opportunity by a very special man. We quickly grew from four people to nine and never looked back. Sobel Shipping Co. Inc. was established in Downtown New York City back in 1949. The company was named after its founder, Hymen Sobel, and it’s continued on ever since. The name remained the same until I purchased Network Brokers International on January 1st, 2018 and elected to enhance the name to pay homage to Network and to rebrand Sobel. The newly formed entity is now Sobel Network Shipping Co. Inc. and we have twenty-three employees to cover every aspect of logistics. We remain one of the oldest brokers in the country. Can you tell us about your main activity in shipping and logistics? The company’s roots started back as an old gritty downtown customs broker that was the core of the firm. When I purchased Sobel, I saw an immediate need to start the forwarding side along with exports. I quickly obtained both our FMC and NVOCC licenses, which changed the whole company. This was a pivotal move that completely changed the nucleus of the firm and started our immediate growth. We now offer air or ocean, fully insured, door-to-door turnkey logistics solutions for all our customers. Do you belong to any global networks currently? Why do you think it is wise to spend money on that? As matter of fact, we do. Once we started handling freight, I saw an immediate need to establish our own partners worldwide and setup long-term relationships. Although I enjoy reciprocating partnerships, I think it’s most important to have a vetted, trusted partner that you know you can rely on. The networks take the time to vet these members and ensure that only the cream-of-the-crop are chosen. I also like the protection one gets from the umbrella that the network provides if one of the members becomes delinquent. Without these networks, you are basically taking the risk of either not getting paid or getting your freight held hostage. We currently belong to Cross Ocean, GAA, G7, WCA E-Commerce and WNA. Could you provide us with some examples of shipments that you have handled? We specialize in all aspects of trade and logistics. While we have gained experience in virtually every aspect of customs brokerage over the past several decades. We have developed a particular focus on serving the apparel, food, e-commerce and trade show industries. We have also handled project cargo to include the importation of oil factories and rail car bodies, to name a few. Again, we handle the smallest e-commerce shipment to the clearance of full tankers of olive oil. You are located in a great city, New York. Tell us about the competition there? We know from overseas forwarders that trucking inland in the USA often can present a headache as costs can escalate rapidly. Could you shed some light on why this may be the case generally? Any rules of thumb that you can give our readers in case they have inland deliveries to make in the US? The competition in New York can be fierce, but we have an impeccable reputation and continue to get several referrals per day. I strongly believe that conducting one’s self in a professional and courteous manner is key to success in this very stressful city. The Sobel Network brand is definitely a key player in the New York market and we are continually growing at a very rapid pace. Currently, the US is experiencing a lot of congestion and waiting time at the piers. We are also experiencing a lack of drivers now that the electronic data log, which monitors how far and how many hours they can drive in one day, is mandated. The US also has fluctuating fuel costs, which can drive up the price and must be calculated back in the cost of the delivery. The winter in the port of New York/New Jersey tends to bring a lack of chassis, so the chassis pool can be depleted quickly causing delays and demurrage. I strongly suggest that one has a very good partner here in the States that can keep you abreast of all of the issues at the current time. We at SNS keep our partners posted with any news or insight form the different ports so that they are fully aware of the current situation at hand. We also request delivery details as early as possible to secure any quote and to ensure that we have truck men available at the time of delivery. Again, a strong, reliable partner is key to navigating the many perils here in the States. Why did you choose a career in shipping and logistics? What do you like about it? I was in college at the time and driving a DHL van part-time in Jamaica, NY, and the outskirt cities of the airport to include the five-town area. Mostly all of my customers were freight forwarders and customs brokers. Fortunately for me, I totalled a BMW on the first day on my DHL route alone and was immediately terminated. Unable to get back into my van, I entered one of the customs brokers where the accident occurred and they offered me a job in their office to learn brokerage and logistics. I quickly learned the business and got my brokers’ license at a very young age. The rest is history. I love logistics because each and every day is different and I enjoy the stress the most. I really enjoy having friends and colleagues worldwide that you can work with and get to know them and their culture. Logistics impacts our lives daily and people who are not in the business really don’t understand what we do and what is entailed. It is a 24/7 career and globalization is a key element of our field. New York is famous in itself for tourists worldwide, but could you enlighten our readers about other beautiful spots to see, shall we say, within two to three hours drive from New York City? Absolutely! 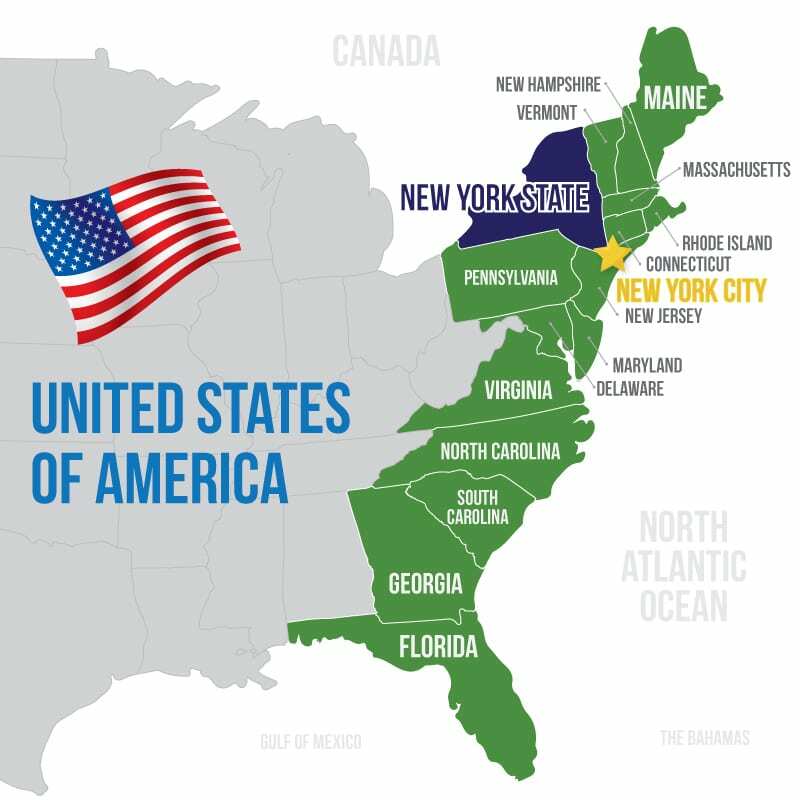 People do not realize that our state is not just New York City, but a vast country including beautiful beaches as well. One can head to upstate New York to experience our beautiful country with great hiking routes. They can visit such places as Lake Minnewaska and the mountainous region known as the Gunks in the Catskills. They can also head out east to Long Island and enjoy either side of the fork. On the north fork, we have our wine country and beautiful farmland waiting for you. On the south fork, there are beautiful beaches from the Hamptons up until Montauk at the end of the fork. We even have whales out on Long Island and an abundance of wildlife. We have far more more than just the diverse Mecca of culture that is New York City!